Voivod are one of those few bands who remain and enjoy their creative longevity as anyone, since the beginning of their career they has been pulling album after album of great level, starting with the explosion of the Thrash metal in the eighties they were able to add progressive elements ending with such masterpieces as "Killing Technology" in 1987 or later "Dimension Hatröss" in 1988 and subsequently lead them into a more progressive spectrum to release "Nothingface" during 1989, or the stunning "The Outer Limits" released in 1993, passing through the ephemeral punk progressive of "Infini" in 2009 and lately their successful comeback to their progressive roots embodied in "Target Earth" three years ago, which has revived the flame of their most diehard fans. 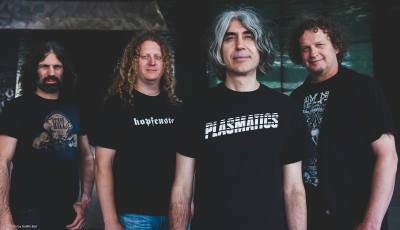 Canadians Voivod have been fairly constant with respect to line-up changes, being the most significant the lost of their former guitarist Piggy who passed away in 2005 and the bassist Blacky, the current line-up is Away behind the drums, Snake performing vocals, Chewy in the crushing guitar and Rocky in the rumbling bass, with this formation Voivod record their latest work an EP entitled "Post Society" which contains five tracks, so let's take a look and find out what they have to offer for our delight. 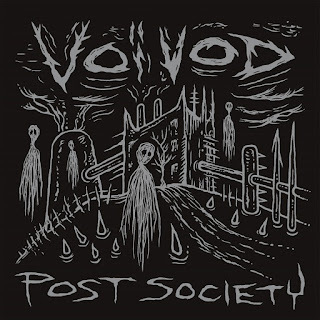 "Post Society" is the first track and gives it the title to this EP, the bass roars loud with some post punk effect and rapidly is joined by striking guitar riff sharp and catchy, Snake vocals is still in good shape, while the drums lead the pace, "Forever Mountain" this track was included in a split with Napalm Death and tends to be in a slower pace, but overwhelming and sullen, the next track is "Fall" with a slightly peaceful guitar work, it turns into a eccentric and dissonant piece with a delirious guitar solo make this one the favorite of the EP, "We Are Connected" is another track previously released in a split with At The Gates one year ago, aiming to recapture some of their old fans and respect of the newest generation, here they shown us a more powerful work as unit, succeeding in every aspect from the fastest riff to the intense and slower pace, the closing song is the cover track "Silver Machine" from the English rock band Hawkwind which is really fun, how they imprint they own style and at the end come to be seriously catchy. 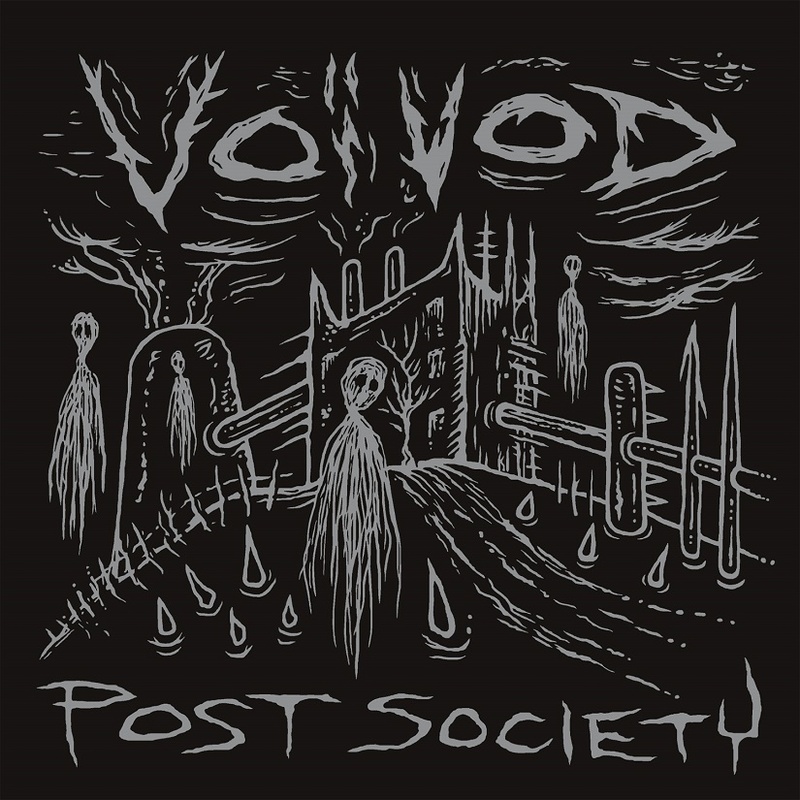 Voivod has been always very distinctive from the pack, at some point I could consider them as the lonely wolf of the prairie, in such case there is no boundaries for them and their creativity and their thirty-five years in the field, it proves how unique they are pick any decade and you will find out, what I'm talking about, definitely Voivod has earned a special place within the metal scene.